Designed to provide reliable camera support and security in situations where you need to mount your camera in an exact position, a camera cheeseplate is a camera support essential. You can use these tools to safely mount your camera or camera accessories so they stay put during high-energy shoots. BarnDoor Lighting carries a large selection of high-quality, easy-to-use Modern Studio Equipment cheeseplates in a huge selection of sizes and colors. Each one is made with durable materials. Cheeseplates have highly versatile, perforated designs so that you can precisely mount them using bolts. 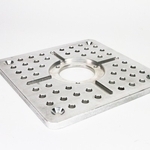 We offer square cheeseplates as well as handy L-plates, round cheeseplates and rectangular styles. You'll also find accessories such as cheeseplate adapters in this great selection from BarnDoor Lighting. Let our expert customer service guide you to the right product for your unique needs. Give us a call at 1-888-276-3667 or send us an e-mail at info@barndoorlighting.com today.